Stomach Of Ancient Iceman Held Microbes Like Ours : Shots - Health News Scientists analyzed the tummy of a 5,300-year-old ice mummy and found bacteria that many modern humans still carry. Researchers have looked in the stomach of an ancient ice mummy and found the remains of the bacteria that lived in his gut. The results, published in the journal Science, suggest that the community of microbes living on and in humans has existed for millennia. Roughly 5,300 years ago, this particular man was hiking across the Oetztal Alps between what's now Italy and Austria when somebody shot him in the back with an arrow. The remains of the fellow, who came to be called Oetzi the Iceman, made headlines when discovered in 1991. "He's very well-preserved. 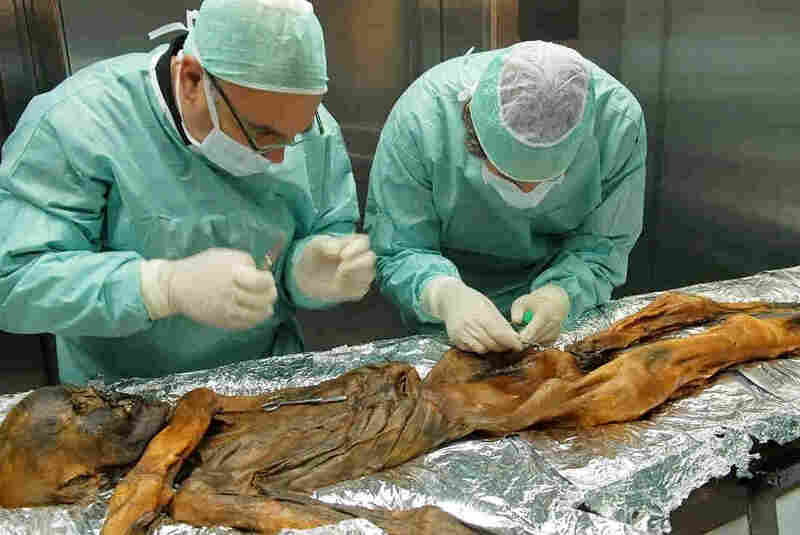 You can see that all his tissues and also his skin is still preserved," says Albert Zink, the head of the Institute for Mummies and the Iceman in Bolzano, Italy. Years of study revealed details about the iceman's diet, health and genetic heritage. But there was one place researchers had yet to probe: his stomach. For a long time, they couldn't even find it because it had shriveled up over the centuries. Then, about five years ago, a researcher finally spotted it, and saw it was full of material. The scientists wanted a sample, so they went in. During the procedure there were so many doctors in the room it actually felt like a surgery on a living person, Zink says. Inside they found the iceman's last supper: meat from a deer and an alpine mountain goat. "He obviously had a big meal before he died," Zink says. Perhaps more interesting, the researchers found DNA from a type of bacteria that lived in his gut called Helicobacter pylori. Today, H. pylori can be found in about half of the world's population, according to Martin Blaser a physician and microbiologist at New York University, who wasn't associated with the study. "In people who have it, it's the dominant organism in their stomach," he says. After it was identified in 1982, scientists pegged it as a harmful pathogen. Researchers have found it causes ulcers and stomach cancer. But more recent work by Blaser and others has shown it also seems to provide benefits. It can protect against some common illnesses, including acid reflux and asthma. "The story is complicated," Blaser says. "And that actually fits in very nicely with this paper because it's consistent with an organism that's been around for a very long time in humans." In fact, H. pylori is part of a much larger community of microbes that live on, and in, virtually every part of the body. Increasingly, researchers suspect this microbe influences our health in many different ways. Finding H. pylori in such an ancient specimen seems to confirm that it has been doing so for a very long time. "It's like finding a fossil," he says. On the basis of genetic evidence, Blaser believes the H. pylori bacterium has been helping and hindering humans since way before the iceman. He thinks it has been passing from generation to generation for hundreds of thousands of years.